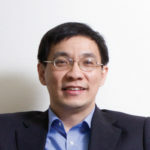 Dr. Somkiat Tangkitvanich obtained his PhD in Computer Science from Tokyo Institute of Technology. He has been recognized as a leading Thai expert in the areas of trade and investment policies, innovation policy, education policy and ICT policy. He was a main architect of Thai PBS, the first public television in Southeast Asia, and many media laws in Thailand. Under his leadership, TDRI is nominated “Person of the Year” in 2012 by the Bangkok Post.